, an English traveller, was the tenth son of sir Peter Ricaut, probably a mer* chant in London, and the author of some useful works, who was one of the persons excepted in the “Propositions of the Lords and Commons,” assembled in parliament, “for a safe and well-grounded peace, July 11, 1646, sent to Charles I. at Newcastle.” He also paid o.1500 for his composition, and taking part with his unhappy sovereign. His son Paul was born in London, and admitted scholar of Trinity college, Cambridge, in 1647, where he took his bachelor’s degree^ in 1650. After this he travelled many years, not only in Europe, but also in Asia and Africa; and was employed in some public services. 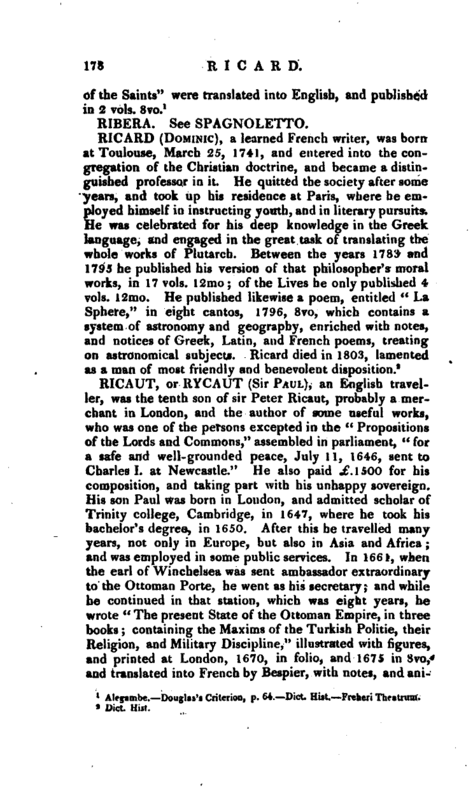 In 1661, when the earl of Winchelsea was sent ambassador extraordinary to the Ottoman Porte, he went as his secretary; and while he continued in that station, which was eight years, he wrote “The present State of the Ottoman Empire, in three books; containing the Maxims of the Turkish Politic, their Religion, and Military Discipline,” illustrated with figures, and printed at London, 1670, in folio, and 1675 in 8vo, and translated into French by Bespier, with notes, and | anittoadversions on some mistakes. During the same time, he had occasion to take two voyages from Constantinople to London; one of them was by land, through Hungary, where he remained some time in the Turkish camp with the famous vizier, Kuperlee, on business relating to England. In 1663 he published the “Capitulations, articles of peace,” &C; concluded between England and the Porte^ which were very much to our mercantile advantage, one article being that English ships should be free from search or visit under pretence of foreign goods, a point never secured in any former treaty. After having meritoriously discharged his office of secretary to lord Winchelsea, he was made consul for the English nation at Smyrna; and during his residence there, at the command of Charles II. composed “The present State of the Greek and Armenian Churchesjanno Christi 1678,” which, upon his return to England, he presented with his own hands to his majesty; and it was published in 1679, 8vo. 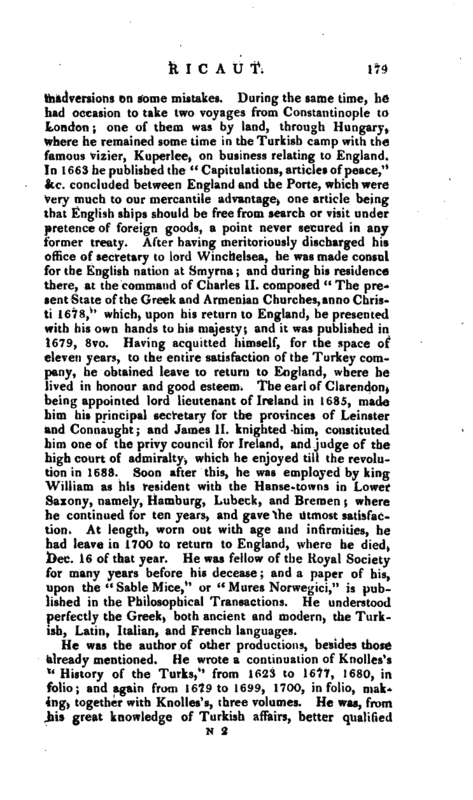 Having acquitted himself, for the space of eleven years, to the entire satisfaction of the Turkey company, he obtained leave to return to England, where he lived in honour and good esteem; The earl of Clarendon > being appointed lord lieutenant of Ireland in 1685, made him his principal secretary for the provinces of Leinster and Connaught; and James II. knighted him, constituted him one of the privy council for Ireland, and judge of the high court of admiralty* which he enjoyed till the revolution in 1688, Soon after this, he was employed by king William as his resident with the Hanse-towns in Lower Saxony, namely, Hamburg, Lubeck, and Bremen; where he continued for ten years, and gave the utmost satisfaction. At length, worn out with age and infirmities, he had leave in 1700 to return to England, where he died, Dec. 16 of that year. 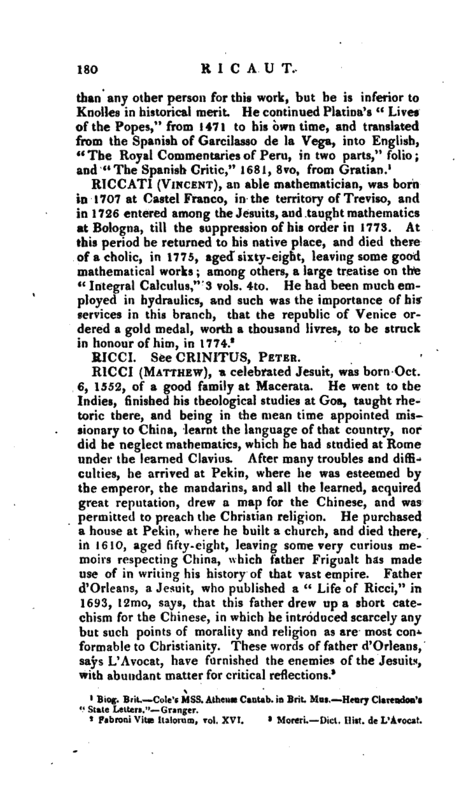 He was fellow of the Royal Society for many years before his decease; and a paper of his, upon the “Sable Mice,” or “Mures Norwegici,” is published in the Philosophical Transactions. He understood perfectly the Greek, both ancient and modern, the Turkish, Latin, Italian, and French languages. Biog. Brit. Cole’s Mss. Athenae Cantab, in Brit. Mus. Henry Clarendon’s “State Letters.” Granger.